When’s the next one due ? J Martin – that depends when the last one was, obviously. Wikipedia says: The little ice age of ~400 to 200 years ago has been interpreted by some as the cold part of a D-O cycle. If the event started in (e.g.) 1700 the next one is a long way off, but the ‘if’ has to be stressed. I think that the next DO event is in 2160 A.D. since the last one was around 680 A.D. This graphic supports your idea (and mine). The quality is a bit off but Jupiter, Neptune and Earth are meeting at the top with Saturn opposite. When J and S are opposed the J-Sun line usually goes very close to the barycentre. Note: 680 is 179 years after the example graphic in the post (501 AD). Congratulations, I think that you have found the underpinnings of the DO events. However, I believe that the mechanism that you are proposing it is not the direct mechanism that affects the Earth’s climate. It is the mechanism that indirectly sets the timing of the DO events. I believe that the cumulative gravitational perturbations of the outer Jovian planets have effectively set the rate of precession of the line-of-apse and line-of-nodes of the lunar orbit. It is these rates of precession that effectively determine the timing of the extreme Perigean New/Full moon tidal events that are responsible for the warming and cooling of the Earth through their effect upon the ENSO cycle. interaction between the precession rates of the lunar line-of-nodes and line-of-apse with the orbital period of the Earth. which is the current time between transits of Venus in front of the Sun. This is still at the stage of scribblings in the sand but I think that it might go somewhere. 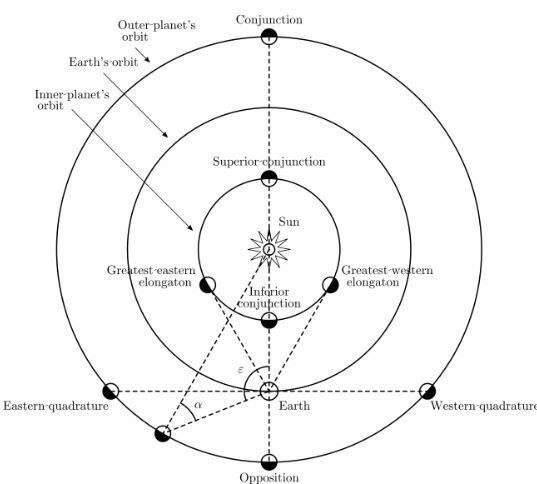 I think we are in agreement that orbital periods of the outer Jovian planets affect both the period of the orbits of the inner Terrestrial planets as well the level of sunspot activity on the Sun. So the Jovian planets effectively set the alignment period of Venus and the Earth in their orbit about the Sun. In addition, I have shown that long-term deviations in the rotation rate of the Earth’s rotation rate (as measured by the Earth’s length-of-day – LOD) are synchronized with abrupt asymmetric motions in the Sun about the Barycentre of the Solar system. It is also possible that the changes in the Earth’s rotation rate could also affect the Earth’s climate. [N.B. 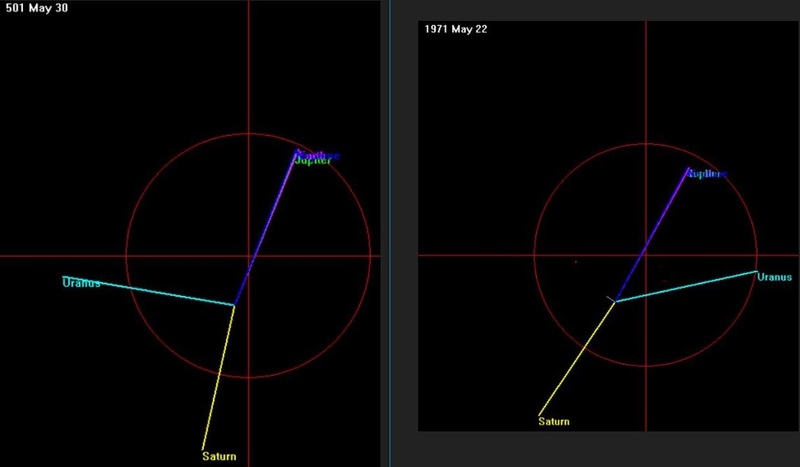 These asymmetries in the Sun’s Barycentric motion are primarily set by the alignment times of Saturn and Neptune in a frame of reference that is rotating about the Sun with the period of Jupiter’s orbit (i.e they are primarily determined by the alignments between Jupiter, Saturn, and Neptune)]. Yeah, sorry but my eyesight is not to good so I probably read the number off the screen as 690 instead of 680. (690 + 1470) = 2160. You are right, it should read 2150 A.D., I think. which means that (41 x Synodic(SN)) – (74 x Synodic(JS)) = 1.096 years ~ 1 Earth year. since the Synodic period of Jupiter and the Earth is 1.092 years. Which means that every1470 years the Synodic period of Saturn and Neptune moves ahead of the Synodic period of Jupiter and Saturn by almost exactly the Synodic period of Jupiter and the Earth. It also turns out that 619 Venus-Mercury conjunctions = 245 years. 245 * 6 = 1470 years. The convergence of relation in these periods is to me confirmation of what Pari Spolter presented in her Gravitational Force of the Sun. That force being consistent throughout the solar system results in a planet’s (or any orbiting satellite) distance from the sun and its orbital speed is directly proportional to the ratio of the planet’s mass to that of the Sun’s (or satellite to parent orb), multiplied by the constant of the sun’s gravitational force. It is also interesting to note that Yukteswar places the binary companion star apoapsis around 500AD based on a 24K yr equinoctial precession cycle, while Brophy’s apoapsis appears at 2051 AD, based on a 25,920 yr precession rate. The difference between these to dates being so close to the 1470 yr conjunction suggests to me that there may be a link between the clock “error” rate of 8% referred to in the above paper, and the variation in precession in part due to the elliptical orbit around the binary star. On a related subject, I have yet to find any papers covering the sudden change in ice-core temperatures beginning with the Holocene. The three previous temperature peaks were larger, followed by more erratic swings in temperature over the subsequent 10KYyr periods. Since the Holocene, the swings have been less dramatic, and the peak was several degrees less. In comparison, the last 10Kyrs have been relatively flat, suggesting that something happened in the solar system just prior to and during the Allerød event, causing the reduction in climate extremes. If earth’s climate is influenced by a shift in the solar system’s barycenter, perhaps there is further reason to accept the Babylonian/Sumerian account of Tiamat, orbiting at the present asteroid belt, being destroyed by an errant planet entering the system. I have yet to see solar system analyses of the past include this anomaly. Van Flandern hypothesized two exploded planets; one in the present asteroid region, and the other in Mars’ present orbit. By asteroidal composition and orbital backtracking, he places such an event 3.2 million yrs ago. He makes no reference to the known geophysical Event around 11.9KBCE, and skews the use of the name Tiamat out of its historical context. He proposes that these two exploded planets were of the same category as the system giants. About the asteroids, he is probably mostly right. About the planets being gas giants, I think he is wrong. In the first place, a planet of any such size (mass) is going to have obvious impact on the 1470 yr cycle, a large impact on the system barycenter, and likely leave identifiable periodicity changes in the planetary geology (which he alludes to, but I think he misinterpreted the evidence). Because he places their demise well before the ice core record it is shear speculation, as orbital backtracking assumes a uniformitarian view of the cosmos. There is just no way such prediction can have any realistic meaning. Earlier this year I ran a spreadsheet comparison of the solar system main bodies, and then extrapolated the size of the supposed exploded planet Tiamat, based on scaling up the size of Ceres to equal one gravity. To get a feel for size I also ran the magnification ratio up to equal 2 earth gravities. For one gravity, it resulted in a planet 65.3% the size of Uranus, and 46.5% of its mass. In all the parameter comparisons, the result was consistent with the curves generated by the existing bodies. At 2 gravities, Tiamat was 130% the size of Uranus, and 377% of its mass. If such a planet existed in the 2 earth gravity region, we would likely be seeing evidence of it in the climate record, modulating the known interactions of the giants. This in my mind completely trashes any proposition by some that Tiamat was a habitable planet. It would have been too cold, and the climate extremes too severe for organic life. It is complete conjecture what the composition of Tiamat may have been. I chose Ceres because it is not an asteroid. It is a sphere like all the major bodies, and not a product of collision. Its composition also tends toward that of the inner planets. Saturn is the fluffiest (volume/mass) of all the bodies by far, followed by Uranus with Jupiter close behind and then the Sun. If such a planet did exist, it likely did not have a significant effect on earth’s climate, since the 1470 yr periodicity stays consistent for 23 cycles as referenced in the above paper. While its proposed demise, as chronicled by the Sumerians, surely had some influence on the barycenter behavior, it seems that some other, more influential effect is the source of the ice core record flattening post Allerød. I have an idea what, but no evidence beyond anecdotal to back it up. We may have the numbers but what about the ‘abrupt’ part? The default assumption, so to speak, might be that all those conjunctions in quick succession could have a specific effect on the Sun. Otherwise we’re left imagining the Sun has its own built-in 1470 year clock, or something outside the solar system is acting as a trigger. What other possibilities are there? – apart from waving it all away that is. We do know that the path of solar motion is closely linked to the J-S/2 period. The pattern of one inner loop with a J-S opposition halfway round, followed by one outer arc with a J-S conjunction halfway through, occurs as a repeating pattern more or less as described, with a few slight deviations due to the ever-changing orbital positions of the other planets. This can be easily shown using the solar simulator. I think that you, and Ian, together, have “got it”. I suspect there is some solar involvement too, but a major aspect of sudden changes of weather are changes of winds and currents in the ocean churning up cold water. That is partly driven by solar UV changes and partly driven by lunar / tidal actions. Every one of the moving parts matters, and there are lots of moving parts. We need to lay them all out in one smooth integrated set of steps. As humans we might hope that the solar system runs fairly smoothly, but ‘abrupt climate change’ found by studies is a bit uncomfortable, somewhere along on the line. FWIW, In history we find bad times arriving on the 1470 year period of Bond & D.O Events, but also on 1/2 that period. IMHO, there is a sub cycle 1/2 period that also matters (and hints of a smaller 1/4 period cool time). To the extent that is true, then the Little Ice Age started about 1/2 period from the last fully agreed event, Bond Event 1, and we are now due for a full event. If you can use planet positions to confirm events, then you can disambiguate if the LIA was Bond Event 0. or a 1/2 Bond Event. During previous cold events the population was agrarian and fixed to the land. Farming practices were by custom for that district. Crop losses were devastating to subsistence farmers and the local city/town people that depended on them. Modern American farmers are constantly changing their practices to make the best of constantly conditions. Food distribution is a World wide operation for much of the “First World” population. BUT! there is now only about 30 days of excess food on hand for the worlds population. One poor crop in the North Hemisphere would mean wide spread famine for the poor of the world…pg. For a dynamic system response, irrespective of external inputs, its own characteristics would likely be dominant. Over the 450k yrs (fig 1), five abrupt changes from one side to the other (bang-bang response) is characteristic of instability, – intrinsic-. The period varies, a chaotic response determined by friction (evident as abrupt and sudden change), which is evident in the shape of the slopes. Fig 3 shows the start of the present – holocene – cycle, and identifies some events ( I have added to the events, at link here – from several/various proxies, all leaving a destruction trail evident from archaeology) https://melitamegalithic.wordpress.com/2018/01/30/searching-evidence/ there are more examples of corroborating evidence at this site. External cyclic forcing on a dynamic system may leave its imprint/signature on its behavior, but many times that is too weak to dominate control of it. WUWT fig 1 shows that that is so. NOAA: Each of the 25 observed D-O events [during the last glacial period] consisted of an abrupt warming to near-interglacial conditions that occurred in a matter of decades and was followed by a gradual cooling. Triggered by Neptune and Earth joining the regular Jupiter-Saturn opposition? You have given absolutely no evidence to support your argument. Just saying that something is intrinsic does not make it so. This is statement is almost totally devoid of any logical content. What evidence do you have that this is so? This is just your interpretation of the data based upon a pre-conceived notion. Re the data: the NASA JPL planetary data (see link in the blog post) gives a better fit to 1470 years than NASA factsheets, mostly due to the different Saturn orbit period. In answer to your comment, let me please start by saying that I came to look at this matter because of anomalies I found in earlier research that interested me; anomalies/questions that I want to have explained. WUWT fig 1 is self evident. The last 450k years give 5 saw-tooth movements in behaviour. That is a system that creeps to a trip point and abruptly goes to the other extreme. That exhibits instability, in my humble opinion, classic theory. That is irrespective of (a) timing, which is also irregular, (b) shape; all four slopes are very different, and this is evident not only in ‘delta T’ but also found in other proxies. It is referred to broadly as ‘friction’ (or ‘noise’ in the electrical world). It is chaotic, and as someone said, with a little stretching one can find any amount of frequencies in such a shape. What I would hazard to say beyond that is, that there are many variable inputs system-wise, mostly intrinsic, because they appear too frequent and irregular for an orbital source. To come now to the anomalies (because they high-light the matter), my interest covered a span of time in prehistory, roughly 2000bce to several millennia earlier. The anomalies were the type difficult to accept. Related to ancient solar calendars axially aligned to equinox horizon sunrise point. (1) two instance of ~45 degree land rotations, which geology is only now beginning to come to terms with (abrupt micro-plate rotations in the Med, plus). (2) Abrupt earth obliquity changes; difficult to stomach, but as I found out, others had concluded same before me. OK, so science still has to come to terms with this. But both have great influence on the earth and both are intrinsic. Incidentally one of the last calendars built, when finally understood (and still fully functional), incorporated a modification for an obliquity change, exactly as others proposed earlier from completely different and unconnected considerations. That is all evidence, galling as it may be to ‘established science’. Yet now, 3 yrs later, a variety of proxies point to events that occurred in prehistory precisely as was anticipated from the evolution in the design/build of the calendars. Unfortunately the proxies don’t offer definite insight to what cause; however they provide ‘date’, and most correlate. 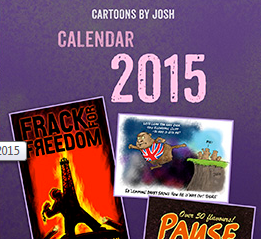 On the contrary the calendars are very clear as to what took place, unpalatable as it is. (the link to site in my earlier post shows the main proxies; plus more). The oscillation pulses were evidently too short in duration to cause significant melting. They were primarily fluctuations between extremely cold climates and not quite as cold climates. It appears that some of the pulses came close to the interglacial level, but remained still below it. The cause for the pulses remains largely a puzzle, as their existence doesn’t fit into the widely accepted Ice Age model where climate fluctuations are believed to be caused by three overlapping, long-term fluctuations of the orbit of the Earth around the Sun, which are termed the Milankovitch Cycles in honour of the man who pioneered the concept. The GRIP project drilled out a 3028-metre ice core, from a summit of the ice sheet in Central Greenland, to bed rock. It took 4 years to drill this ice core, from 1989 to 1992. The oscillations were discovered in this ice core, with obviously no small surprise. NB the author was not aware of the contents of this Talkshop post at the time of writing those D-O notes. Nice, oldbrew, and tks. But do consider that the Joker is still loose in the pack. Milankovitch in a better light? 223 (Neptune) is a prime number.